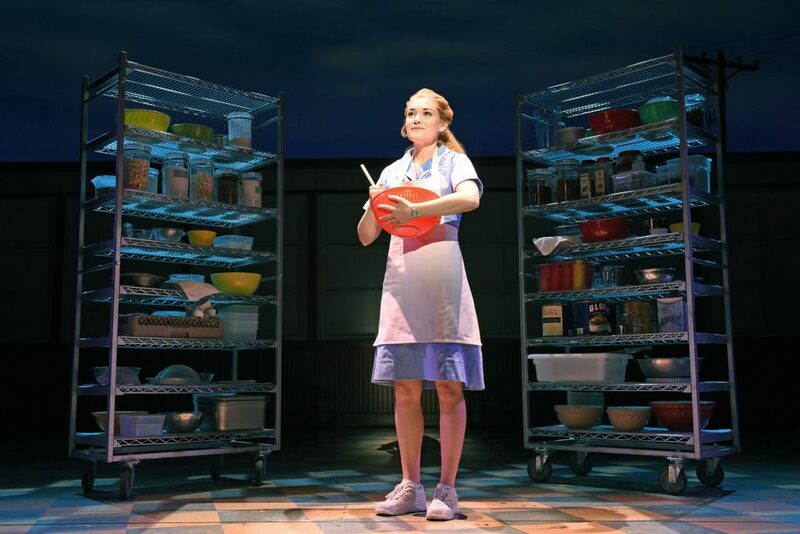 Waitress is based on a 2007 film of the same name, written and directed by Adrienne Shelly. It’s a quirky, funny, and charming film that seems like an interesting choice for a musical adaptation. And the songs in the musical are really good, with the entire story translating surprisingly well to the stage. Yet the problems lie not in the adaptation – as the story and dialogue are pulled mostly straight out of the film – but rather with the source material. Any issues I had with this often hilarious and entertaining show come from the moral ambiguity it presents. 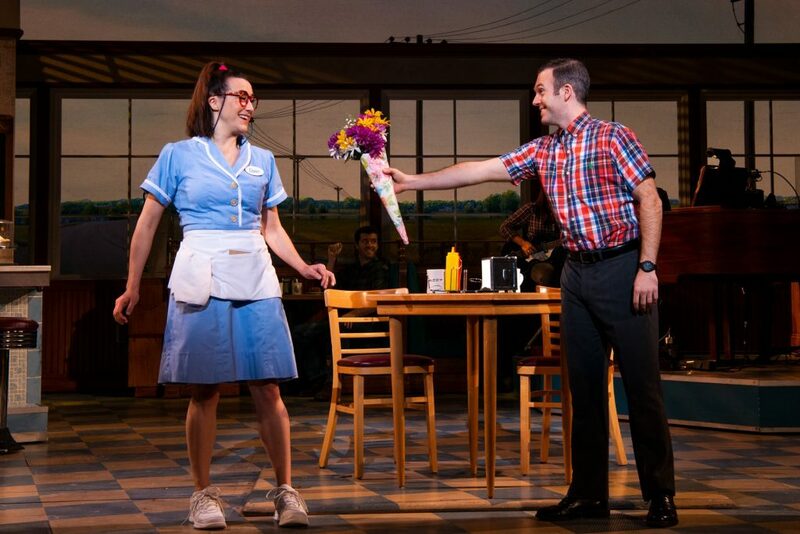 Jenna (Christine Dwyer) is a waitress and Joe’s Pie Diner. She works as much as she can, mainly to stay away from her awful, abusive husband Earl (Matt DeAngelis). Outside of baking pies, which is her one true love, she relies on her best friends and co-workers – Becky (NaTasha Yvette Williams) and Dawn (Ephie Aardema) – to keep her sane. Near the beginning of the show, Jenna finds out that she is pregnant with Earl’s baby (“The Negative”) – a product of a drunken night and a red dress. This is the last thing that the mother-to-be wants, as she fears it will only tether her closer to her husband – and she will never get away. So she goes to her OBGYN – except her doctor since birth is retired, and has been replaced with the quirky yet sweet and handsome Dr. Pomatter (Steven Good). I’m sure you can see where this is going. And yes, Dr. Pomatter is also married. So of course, without spoiling too much, the two of them become romantically involved. But we already have multiple flags on the court here. For one, they are both married. Yes, Jenna is in an abusive relationship that she desperately wants to escape. I get it, and that is the most excusable of all situations. I feel she should leave her husband and get divorced before embarking on a new relationship – but if anyone can be forgiven, it is her. But remember, Dr. Pomatter is also married. And there are no signs that his wife is abusive, or even that they have a bad marriage. In fact, when we see her in ACT II – she seems like a delight! So Dr. Handsome may not be completely fulfilled in his marriage, but that doesn’t mean he should go sleeping around. But the even larger problem – and this is catastrophically bigger – is that he is Jenna’s doctor! The idea of a gynecologist, or any doctor for that matter, becoming romantically involved with their patient is extremely disgusting. It’s unethical and just plain wrong. If he developed feelings for her, and she feels the same way, he should have immediately excused himself from being her doctor – and then maybe they could talk. But that isn’t the case here. Throughout the entire show, Jenna keeps going back to see him, and they keep having their affair. And in the doctor’s office no less. It’s extremely uncomfortable, and very problematic that it is written off as comedy. Yes, there are plenty of laughs derived from this situation. But they come at the expense of an extremely morally questionable plot. It’s something that many people just don’t want to see. So at least if you’re reading this, you can be prepared. But that isn’t the only other infidelity at play here. Again, I don’t want to spoil too much of the show before you have the chance to see it. But two of Jenna’s coworkers have affairs, and they are both married as well. And their excuse? That they are not happy, but they still love their spouses. So that somehow makes it okay to cheat on them? This is yet another one of the morally questionable decisions of the show. Look, I get that sometimes people aren’t happy in their marriages. I myself have been divorced. And I am not saying that you can’t grow apart, or change, or whatever causes you to seek comfort elsewhere. But that also doesn’t mean that you should just have affairs because it makes you feel good. That is not an excuse, and I will never be on board with that. Get a divorce, leave your significant other – then do as you please. But you aren’t going to convince me, as two of the characters try to do, that it is okay to stay with them while cheating because they love them – but just aren’t happy. On a positive note, everyone in this show is fantastic. And clearly, they did not write the story, so my problems with the script do not fall on them. Christine Dwyer has an amazing voice and is extremely likable in the lead role. Williams is hysterical pretty much any time she comes on-stage, and Aardema is such a delight and the odd yet loveable Dawn. Steven Good, even if I don’t agree with his character’s choices, is excellent in the role. I really like how the show breaks the fourth wall, in a similar fashion to how the film does. It is extremely clever the way sets fly in and out, and the ensemble assists with outfits or props coming in and quickly leaving. I love the creativity behind this production. Richard Kline plays Joe – as in Joe’s Pie Diner – a role originated by Andy Griffith in the film. Kline is fantastic as the curmudgeonly old man with a heart of gold. And Ryan G. Dunkin plays Cal, the cook, and manager of the diner. He says a lot without saying anything, a testament to his physical comedy chops. One of my favorite characters in the show is Ogie (Jeremy Morse), who becomes infatuated with Dawn after a five-minute date matched from online. What I really was impressed by was the performance and never-ending energy from Morse. After his first scene, where he shows up to see Dawn again (“Never Ever Getting Rid of Me”), he had the entire theatre erupting with applause. I honestly thought he was going to receive a standing ovation in ACT I. The actor is absolutely hilarious – and extremely talented with his dancing and jumping around the stage while singing his heart out. Now for the bad part – once again, we are faced with a moral dilemma when it comes to Ogie. As friendly as he seems, and as wonderful as the performance is, the character comes off a bit stalkerish. It’s played up for laughs, but Dawn tells him on their date that she never wants to see him again. And she tells him at the diner, after comedically trying to avoid him by hiding. And that is why he sings the amazingly performed song “Never Ever Getting Rid of Me” in the first place. I’m sure for anyone who has experienced this type of behavior, especially after an online meeting gone bad, this would be uncomfortable. And there are a lot of crazy people out there – so this is nothing to mess around with. With all that being said, Ogie ends up being perfect for Dawn, and once they are both on-board – the rest of the audience and I were as well. Morse steals the show with his performance, and his chemistry with Aardema is wonderful. It’s unfortunate that it is tainted by a troublesome script. 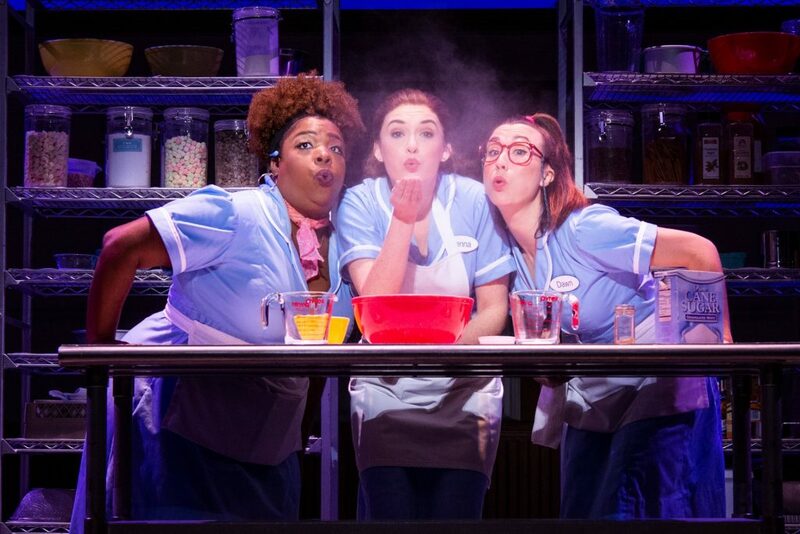 Waitress features original music and lyrics by Grammy-nominated singer/songwriter Sara Bareilles (“Brave,” “Love Song”), with a book by Jessie Nelson (I Am Sam). This show was a difficult one for me because the music and performances are great. I had an enjoyable time taking in the songs, but it was often interrupted by terrible character decisions. In the end, the characters only sort of figure things out – and I don’t agree with many of their ideas. I was hoping for a complete redemption in ACT II, but by the end of the show, it was too little too late. So at least you will know what you are getting into. Great songs. Excellent Performances. Questionable, and sometimes deplorable, morals. 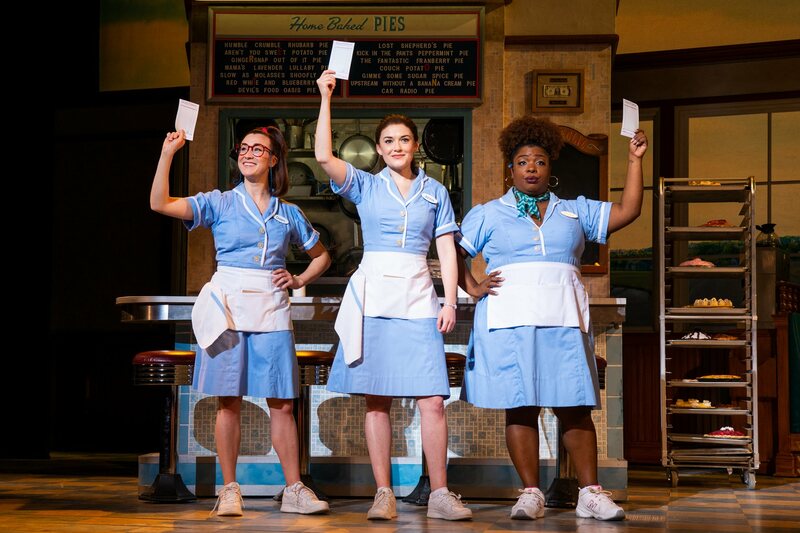 See Waitress at The Fabulous Fox through April 7. Tickets are available via MetroTix. 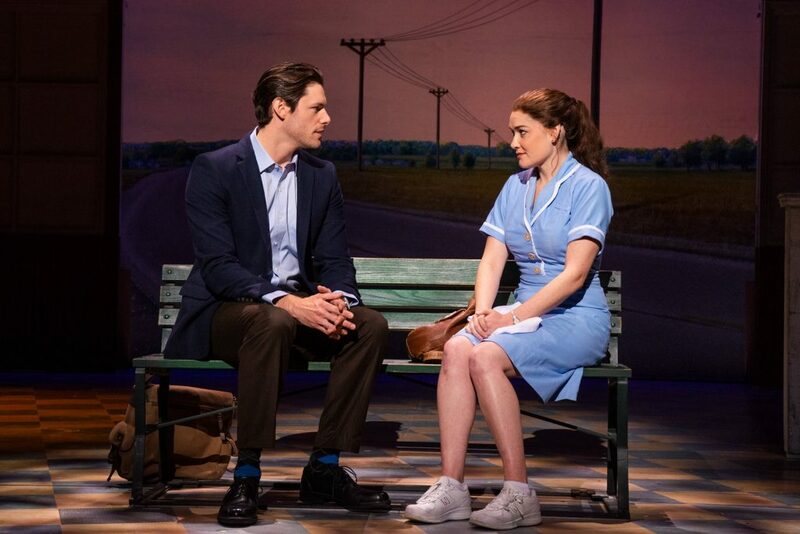 For more information, visit fabulousfox.com or the official tour site at waitressthemusical.com.